When Kobe Bryant recently penned his retirement letter “Dear Basketball” many were surprised to learn it wasn’t published on the Lakers official website nor that of the Los Angeles Times, USA Today or even ESPN. While the five-time NBA champion’s career move was expected for those following his recent on-court struggles, the official announcement was exclusive to ThePlayersTribune.com – the website ex-Yankees player Derek Jeter launched in 2014 following the end of his own decorated career and one Bryant has reportedly invested in. A relatively unheard of website now benefited from the snowball effect that one Kobe Bryant tweet can initiate – traffic, social shares and, thus, monetization opportunities. What a site does from there, as any Web professional knows, is the true testament to success. By some accounts Jeter and his team were ready in terms of what it takes to capitalize on an influx of new traffic. For starters, a lightbox (see image) encouraging new visitors to sign up for its mailing list was presented, along with options to choose the type of coverage they’d like to receive (e.g. NBA, NHL, MLB) to make emails relevant to individuals (which of course increases open rates, click-throughs and more). “Wouldn’t that be nice?” – mumbled every information publisher in the world. Jealous? Sure. ThePlayersTribune.com’s disregard for revenue - in a time that it saw its most clicks - is likely the result of a certain rich-guy's ideals of offering a place for professional athletes, who are tired of the media, to tell their stories. The money will simply flow after that, right? Wrong, until proven otherwise. While the site will see the incremental effects of the Bryant retirement exclusive for years to come, its dissent from traditional media is what might cost it success. 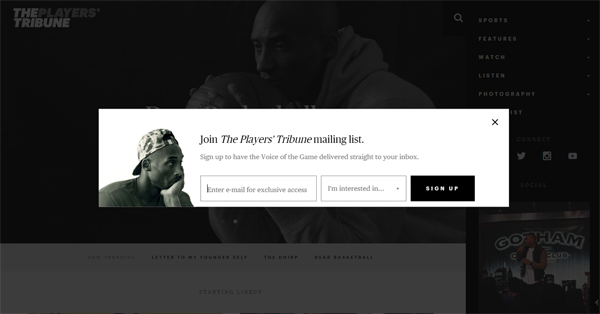 Information publishers have littered their sites with the banner ads The Players Tribune has sworn off to stay in business. Publishers have too tried the branded content the site plans on producing - and with mixed success as readers become more savvy about native advertising and learn to dismiss it just as quickly as more traditional messages. Kuddos are due, of course, to the talented Bryant, and his commitment to a single team since childhood and to the game of basketball in general, as well as to Jeter for hiring the right people to produce a slick site, but exclusive retirement announcements from one of the greatest athletes of all time don’t come easy and neither does everyday traffic. Even with deep pockets and contributed stories from other greats like Steve Nash, producing good content doesn’t win the race to monetize the sites that host it. That’s a lesson ThePlayersTribune.com will likely begrudgingly have to learn from the media greats who know this game better. If the alternative - that publishing good content brings in good revenue - happens, however, we have more to thank Bryant for than just 20 years of entertaining basketball. It'd be his greatest assist in a career too many thought he didn't do enough of. Unlike then, however, he is now our peer in the game of information publishing and lucky for us if he changes that one too.